Mont Lachat (2050 metres) is the high point, with 360 degree views, of Le Grand Bornand ski station. 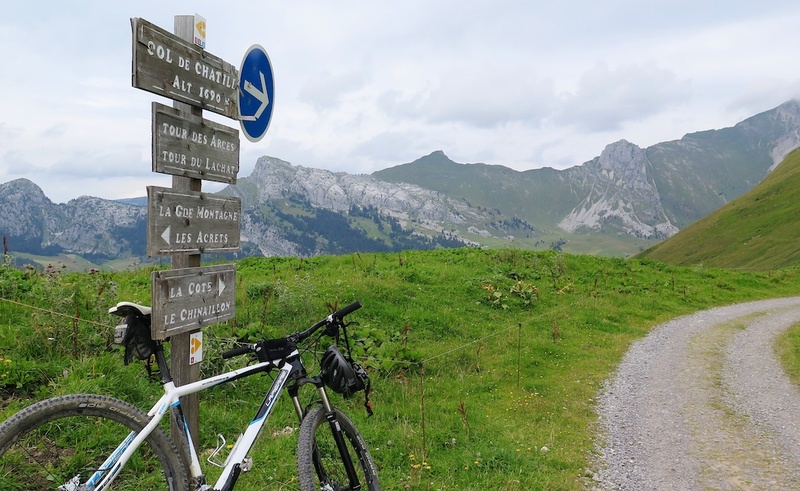 This route does a mountain bike loop around Mont Lachat, with a quick visit up the easier side of Col de la Colombière. Starting from Le Grand Bornand, it took a while to get through town: Thursday is market day! Once I dodged the crowds, the road turned up. Initially it is paved, until the Restaurant de la Croix, then the road is primarily gravel. 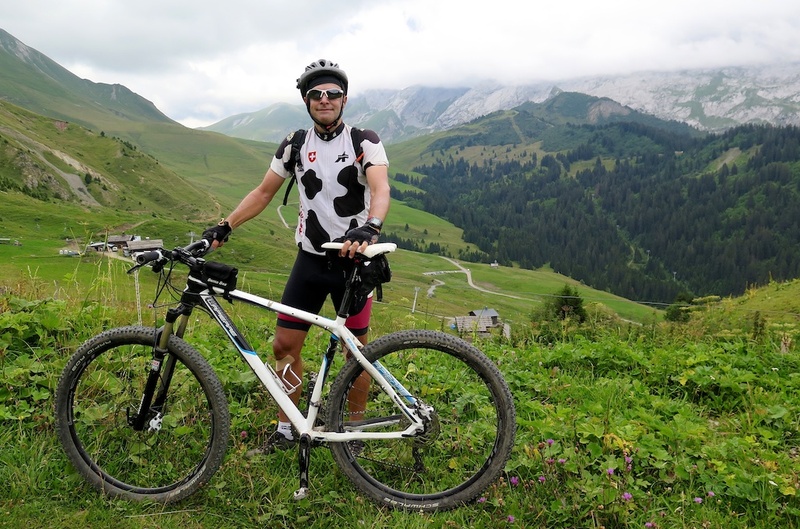 Unfortunately, it was a cloudy say, but this is a beautiful place – with sun, the Aravis Alps are like mini Dolomites. My first goal was Col de Châtillon (1690 metres) on the shoulder of Mont Lachat. I briefly considered taking the very steep, gravel route to the summit of Mont Lachat, but I felt more like exploring than pushing. 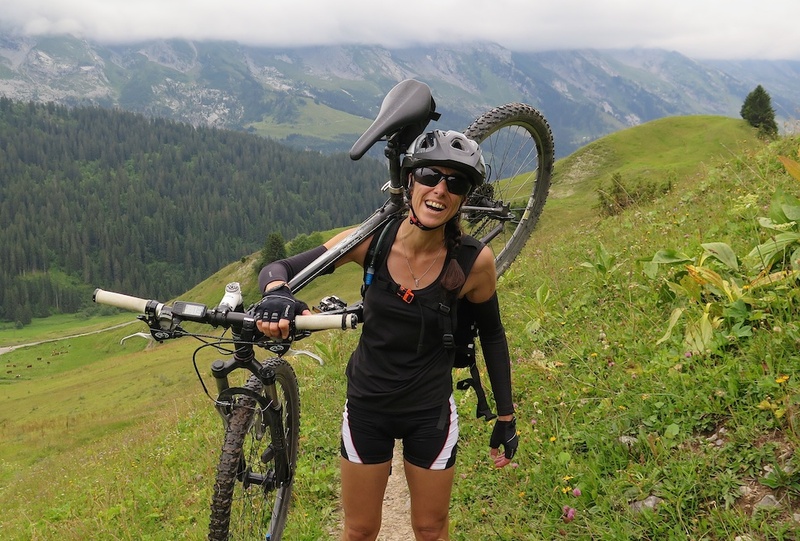 At the Col, I met Julie from Paris – she had mountain biked up the other side. We shared route notes and decided to proceed around Mont Lachat together. There are “Tour du Lachat” signs that are easy enough to follow. Soon after the Col we had nice views of Col des Annes, a favourite road climb – harder than its neighbour Colombière – details here. From here it is a very fun descent down the other side of the mountain towards Chinaillon. As I joined up with the main road, I realised it was only 3 kilometres or so up to Col de la Colombière. This stretch is the most interesting part of the climb to Colombière from this easier south side. 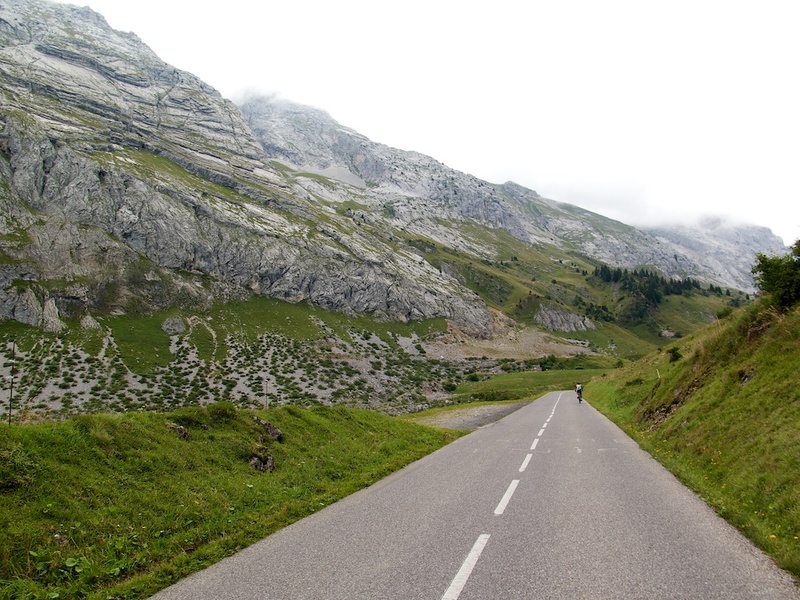 For details of all three road routes to Col de la Colombière – see here. Descending from Colombière, I left the main road before Chinaillon to climb towards Mont Lachat again, passing a nice lake packed with families and fishermen. Finally, I turned down and descended back to Le Grand Bornand and the start. The only flaw to this great loop was the cloudy weather. I’ll have to visit again on a sunny day.